So last issue Hitch and Merino upped the action as the Justice League faced the Purge and the Kindred. In issue 4, things slow down a bit. There are some explanations, but not a lot. In other words, just when it felt like this opening story arc might take off, it grinds back to a halt. 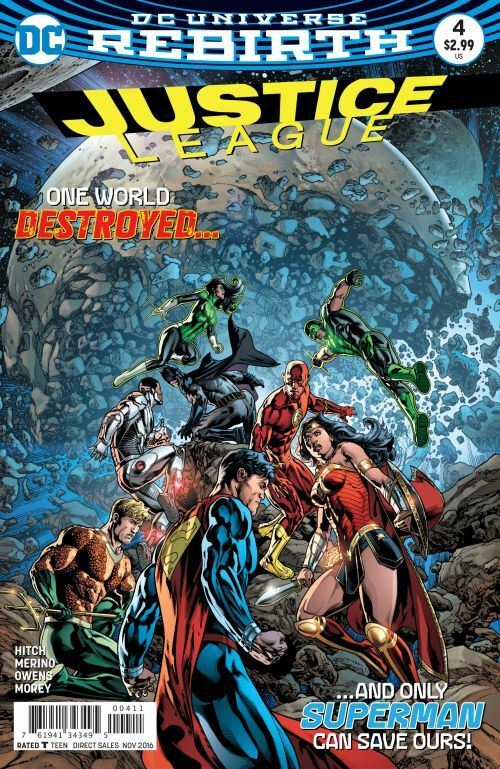 The various members of the League continue to operate singly, for the most part. The two Green Lanterns are out in space, learning what little they can from the remains of the planet the Purge came from. Aquaman has a brief scene in Atlantis, continuing to talk about the Zodiac crystals as if they are really important. I assume they will be, but this thread just isn’t moving. The best parts of the story deal with Batman and Cyborg, as they protect Lois and her young son, while Superman is down in the Earth’s core destroying the Extinction Machines. Batman is losing faith in this Superman. To refresh, he is the one we know and love from the pre-New 52 universe, but that makes him an unknown quantity to Batman, who is more than ready to give up on him. Lois’ faith in her husband, and her arguments with Batman, are the only moments when this issue kicks into high gear. The Flash encounters the Kindred, who look great. I have nothing bad to say about Merino’s art. But I had all but forgotten that Wonder Woman had physically dove into the Kindred in the last issue. One might expect some great revelations from her journey into these beings, but really all we learn is that the Kindred and the Purge are opposite forces, that Earth is in great danger no matter which one prevails, and there is more going on than the heroes understand. In other words, we learn what we have surmised since the very beginning. Cyborg gets some great visuals, and proves to be of more importance than expected in the cliffhanger. No worries about me spoiling the scene. It’s really not very clear what is happening, or being revealed. But it does look excellent.